According to media reports, Congress workers forced hotel 'Aditi', located near KEM Hospital in central Mumbai, to down its shutters yesterday over a pointed message taking a dig at the Congress government over service tax and scams under UPA government. A report in the Mid-Day newspaper said “Around 30 to 35 workers of the Indian Youth Congress which is chaired by party vice-president Rahul Gandhi approached the restaurant, Aditi Pure Veg, around 3 pm. Led by Ganesh Kumar Yadav, city president of the party’s youth wing, and party MLA Kalidas Kolambkar, they approached the hotel and asked the owner to shut shop. After protesting, they had registered a complaint with the police. What made congress workers upset on the Aditi Hotel? 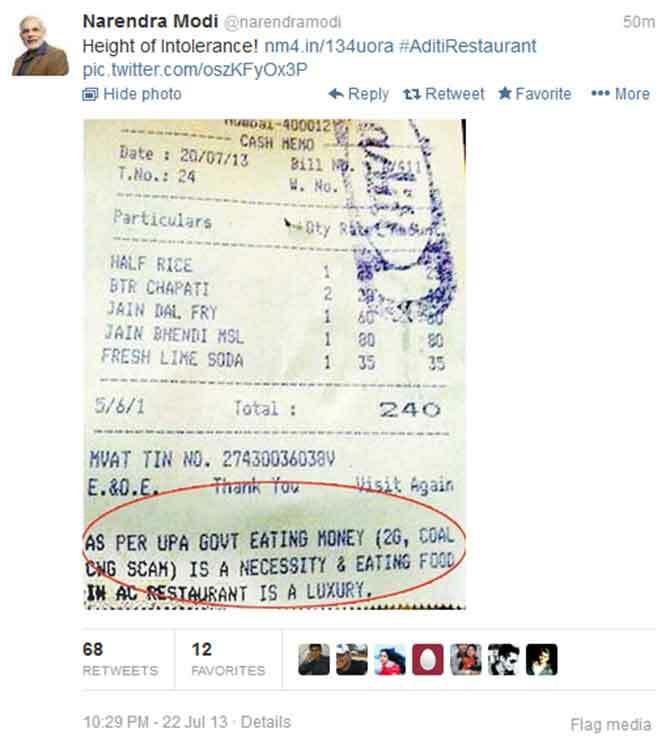 Aditi Hotel gave the bill to the customers on which it was printed that as per UPA govt eating money : 2G Coal scam and CWG scam is a necessity and eating food in an AC restaurant was a luxury! The Centre has imposed service tax on taxable service provided in restaurants with air-conditioning or central air heating with effect from April 1, 2013. It is an excellent idea to show protest against government. But in India citizens have no rights they live in fear of politicians and government departments. Reason is simple = In India for mental harassment there is no punishment jail term or monetary fine, which will teach a lesson to accused. Is it not a crime to create a fear in the mind of individual Indian citizen? 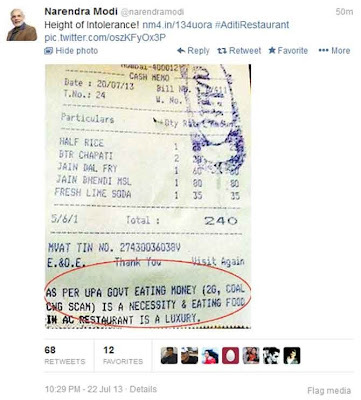 After this incident Gujarat Chief Minister tweeted that the incident was the ‘height of intolerance’. Uh oh, looks like someone really screwed up.